Twin Aviation, Inc., is an ASA-100 accredited independent distributor of aircraft parts and supplies. Their emphasis is on military aircraft equipment, and in particular the Black Hawk helicopter. Through advanced inventory management, deep market knowledge, and experience the company is able to provide customers with parts much faster than many original equipment manufacturer (OEM) suppliers. Berenice Carmona provided assistance with country and industry specific market research, analysis of potential buyers and sellers in target markets, guidance on expanding into new global markets, and assistance with export control compliance. As a result of the assistance Sergio received from the International Trade Center, Twin Aviation has been able to reach out into new countries and expand its existing business. This year they have increased sales by more than 200%, and now have major contracts in Colombia, Malaysia, Mexico, Turkey, and very soon will be expanding into the Middle East. Tim Porter is founder and CEO of Appddiction Studio, which specializes in mobile application development, web applications, and designs utilizing multiple platforms. Appddiction takes clients’ visions and transforms them into focused, functional, and user-friendly designs. Tim is a service-disabled veteran who served in the military for many years before being injured in the line of duty. He started Appddiction Studio in 2011 with the help of the University of Texas at San Antonio SBDC Procurement Technical Assistance Center (PTAC). services including assistance with obtaining local, city, county, and state certifications as well as registrations in support of state and federal solicitations. They also helped develop a winning marketing capability brief for the public sector market. Tim Porter is not only a rising star entrepreneur but also a premier community leader evidenced by his creation of the Appddiction’s StopBullies program. This program is designed to combat bullying by empowering victims and witnesses to take action. Appddiction is rapidly growing and recently secured a contract with the San Antonio VIA Metro Transit for $80,000. Genaro Gonzalez and Olga Martinez emigrated to the United States from Juarez, Chihuahua, Mexico and started Oasis Tire and Wheels in 1999. Over time, Oasis grew from one to two locations and the couple was looking to expand their business further. When an opportunity to purchase three new locations presented itself, Genaro and Olga contacted the El Paso Community College SBDC. they compiled consolidated financial projections for the operating and passive companies and completed the loan packaging in December of 2013. Genaro and Olga were approved for over $2.8 million in loans. The couple is a classic example that opportunity is still alive and well in the United States. When opportunity is coupled with an extraordinary work ethic, you get people like Genaro and Olga that have grown a small one store operation to five locations and over $6 million in sales. Alpine Furniture Store, Inc. is a family run company that has been in business for over 15 years. The company was established in 1999 by Frank & Dale Ohl, and was turned over to family members Eric and Ann Foust in 2004. Alpine sells furniture, bedding, household appointments, and tourist items. After experiencing some success, the Fousts were interested in expanding and moving the business to a permanent location. Their CPA referred the couple to the Sul Ross SBDC for assistance. They began working with Business Advisors Patricia Long and Ken Winkles. The couple received training on QuickBooks and was advised on debt consolidation and loan packaging. The assistance from the SBDC allowed Alpine Furniture to expand to include two additional companies, Alpine Solar Sales and Alpine Secure Storage. The Fousts were also able to move and settle into a new location where the three separate but united businesses are thriving. After 15 years working with other companies in the industry, Eddie Martinez’s career had reached a plateau where further advancement with his employer wasn’t possible. Unsatisfied with the position, he made the decision to step out on his own and start a structural cabling business. Eddie and his wife Jenny carved out a corner of their dining room to be his office and turned their home phone into their business phone. and helped move EDI from a sole proprietorship to an LLC. James was also able to provide assistance that allowed the company to be listed on the Texas Centralized Master Bidders List. EDI has doubled their workforce and outgrown the home office. For a short time, they leased a small office and have since purchased a facility with over 2,000 square feet of storage and office space. In the first year of operation, the company grossed over $200,000 in revenue and received the Start-Up of the Year Award from the San Angelo Chamber of Commerce. Coach Kevin Pitasi began his love for gymnastics and tumbling over 20 years ago. Kevin is a USA Gymnastics Safety Certified Coach and holds a Power Tumbling Certification from the Texas tumbling and Trampoline Association. After moving to Eagle Pass from Dallas, Kevin was struggling to find a job that suited his education and skills so he decided to start his own business. obtain the licenses and permits needed for the business in addition to receiving assistance with recordkeeping. With the assistance of the SBDC, after only one year in operation, Awesome Athletics is now located in a 3,100 sq. ft. facility, has an enrollment of over 300 students, and has plans to further expand the business. Kevin also wants to expand into neighboring cities such as Del, Rio, Carrizo and Uvalde and would like to create a class for children with special needs. For as long as she can remember, Dr. Dawn Fradkin wanted to be a veterinarian. After earning her Doctorate of Veterinary Medicine from Texas A & M University, she started Bergheim Pet Hospital and Clinic in Boerne, TX. The practice offers the latest science and technology for keeping pets healthier and improving their quality of life. After looking into options for expansion, Dawn was referred to the San Antonio SBDC by a friend. She was interested in purchasing her current building and land, remodeling, and putting in a water well. Business Advisor David Baenziger met with Dawn and discussed various loan options and implementation timelines. They went over her financial statements, and David analyzed five different loan packages and provided guidance to Dawn on the best option for her business. With the help of the SBDC, Dawn was able purchase the real estate the practice was built on, and began planning for further structural expansion. She hopes to bring on an associate veterinarian in the near future to help with growing the practice. business tenure, and was voted Top Entrepreneur by BigAustin in 2005. She is a bit of a serial entrepreneur, and after selling her last business to a national pet store chain, she looked into other options for starting or expanding a business. equipment needed to start their own company. Candace was referred to the Texas State SBDC for assistance. She began working with Business Advisor Joe On Lam to develop market validation, a business plan, and financial projections for a loan package. The couple was approved for and offered an SBA 7(a) loan. Candace and Tim were able to secure the funds and purchase the equipment and a new building for production. The company reported its first quarterly profit this summer, and the couple is looking to expand further by obtaining an ISO-13485 certification. Owning and managing a small business seems to come naturally for Dwayne Simper and his wife Melissa. Dwayne has owned a fence construction and ranch operation since he was 16 years old, all while working an additional full time job. Dwayne feels he was born an entrepreneur and is always keeping an eye out for their next opportunity. Advisor Kacey Lindemann- Butler provided assistance with writing a business plan and loan packaging complete with cash flow projections and financial statements. With the loan they obtained Dwayne and Melissa purchased the business and real estate known as Maresh Drilling Company. This is the first retail business the couple has owned and they are eager to continue growing their business. Dwayne said that since purchasing the company, his phone rings non-stop with new business. Manny Vasquez was one of the very first employees to be hired when Lock Doc originally opened its doors in 1982. For over 30 years Manny was a successful member of the Lock Doc team, and dreamed of one day owning a business of his own. He holds almost every certification that a safe and lock technician can have and is the only lock tradesman in the area with clearance to the Naval Air Station. In 2013, his dream became a reality and Manny purchased Lock Doc. Manny contacted the Del Mar College SBDC for assistance before he purchased the business. SBDC Business Advisor Jamey Jones was able to help Manny with startup assistance, writing a business plan, financial preparation, pro forma projections, and asset evaluation. After being injured in a motorcycle accident, Manny questioned whether purchasing the business was the right decision. But with the help of the SBDC, Manny and Sandra made the decision to move forward with the acquisition and in early July of 2013, they secured the necessary loans and purchased Lock Doc. Lakeside Pharmacy was established in 2008. Partners Tomas Contreras and Ricardo Herrera started with one store in east Laredo close to Lake Casa Blanca. They were interested in expanding their business, and possibly opening a new location. helped to develop financial statements in order to secure a small business loan. With the help of the SBDC, Tomas and Ricardo were able to secure a business loan to open two new stores. In addition to Lakeside Pharmacy, Tomas and Ricardo now own the Medical Plaza and Lakeside South Pharmacy. The duo is excited about the success they have experienced so far and look forward to growing their business. research, financial projections, and loan packaging. Maria and Hugo were approved for an SBA loan, which allowed them to purchase the store building and to perform much needed remodeling. The couple recently began offering summer camps for kids. Combining retail sales and teaching is a natural combination for the Arjonas. They are able to share their love of baking and decorating with children, and reach a new market. One of the students recently won second place for a wedding cake in the That Takes the Cake competition in Austin. Nick Dominguez spent his entire career working in electronic communications. He worked for various cell phone telecommunications companies before he started Vertical 1 Communications along with his wife Cecilia, in 2004. Vertical 1 Communications specializes in communication tower construction, maintenance, and repair. Cecilia first contacted the El Paso Community College SBDC in 2009 to look at the possibility of purchasing a new building. The Dominguezes had been running the business from their home, and after experiencing a steady increase in sales were ready to expand. Business Advisor Joe Ferguson, was able to work with Cecilia in creating a feasibility analysis, business plan with financial projections, a formal loan proposal for the credit union and CDC, and with applying for an SBA 8(a) certification. Vertical 1 Communications had a grand opening ceremony at their new location on February 22, 2013. The new building is located on approximately 1 acre of land, and has office space, a 3,600 sq. ft. warehouse, and a large yard for equipment storage. In addition to increasing their business space, they were able to hire ten new employees. Sales are forecast to increase by 42% by the end of 2013. Rebecca Lewis has over thirty-two years of experience in the healthcare industry. She has worked for a number of clinics and hospitals, in addition to owning her own practice for seven years. Lewis has dedicated her entire life to taking care of people. In early 2013, she was not able to give her patients the quality of care they deserved because of a lack of support personnel, so she decided it was best to shutdown her practice. Sul Ross SBDC to create a business plan and loan proposal. With the help of the SBDC, Lewis was able to obtain a $75,000 commercial loan for business startup costs and working capital. Lewis understands the importance of having a well-balanced and enthusiastic staff. She is excited about the potential Big Bend Family Practice shows, and is happy to have relief staff on hand so she can spend time with her family. Lewis plans on keeping in contact with the Sul Ross SBDC, and looks forward to bettering her practice and continuing to share her love of medicine with her patients. A common thread, “Made in the USA,” runs through Leggett Tactical Solutions (LTS), a manufacturing business in Eden, TX. Brother team, Blake and Bryce Leggett, along with lead designer, Juan Vasquez, launched LTS four years ago and White Wing Label two years ago. Angelo State University SBDC for assistance, and began working with Rural Business Advisor Peggy Rosser. Rosser was able to help the entrepreneurial brothers with a business plan, human resource management, and government contracting. After researching and identifying a void in “American Quality” in the men’s sporting gear and luggage market, LTS created White Wing Label. White Wing Label is now sold in over 250 retail outlets around the nation. LTS was awarded a $1.1 million dollar contract with the military, and the company is looking to expand into a women’s product line in the future. Alejandro Esquivel grew up in Mexico, and after completing his education ran his own dental practice for five years in Piedras Negras, Coahuila. In 2008, Esquivel was accepted into a residency program at the University of Puerto Rico. Following his residency, he began working for a dental clinic in Texas. Smile Factory is currently the only pediatric dentist in the Eagle Pass area, and Esquivel looks to keep that strong presence in the community by continuing to learn and improve business practices by attending training provided by the SBDC. The company is experiencing great success, and Esquivel looks forward to continued growth, and the possibility of expanding his business. With over 35 years of management expertise in environmental, engineering and construction, Pat McMullen started an electrical contracting company in 2010. McMullen Global Services is a service-disabled, veteranowned small business providing electrical contracting services to three distinct markets – Federal, Commercial and Industrial. Prior to starting the business, Pat sought the guidance of several experts including business advisors Crystal Darby, with the UTSA SBDC and Deirdre Pattillo in the Employer Services Program and the Veterans Assistance Program within the UTSA SBDC PTAC. The advisors were able to help with refining the company’s business plan, developing an employee manual, coaching on how to secure a bond, the creation of an effective marketing message, and loan packaging assistance, which resulted in a $1 million SBA loan. McMullen Global Services has experienced considerable success in government contracting, and is eager to further expand into the commercial sector. They were recently able to focus the company’s marketing efforts on pipeline and electrical installation, and acquired a commercial contract with the largest pipeline firm in the United States. Chris and Jen Forgey started Light Bohrd, LLC after many years of supporting their son Mason, a junior skateboarder, at competitive meets and tournaments around the nation. Light Bohrd was initially focused on skateboards with embedded motion-activated lighting technology, and has since branched out to include long boards, snowboards, skis, helmets and other sports-related gear. Future Show in 2013 with a new shirt that uses an athlete’s own motion to activate a lighted front logo and back graphic. They competed against 4,000+ worldwide entrants, and walked away the winner with a $25,000 prize. The Forgeys are excited about the momentum the win provided, and look forward to the continued growth and expansion of their business. Freund Funeral Home has been a family run business since 1924. After working for the home for several years, Eric and Dawn Draper decided to purchase the business to carry on the family legacy. Though not blood relatives, the Draper’s are like family, and the previous owners were excited to keep the “family” business going. Eric has worked in the funeral business for several years, and Dawn has over seven years of bookkeeping experience. the bank. Due to the assistance Barr provided, the Drapers were able to qualify for a $1.16 million SBA loan, which allowed them to purchase the business and perform some needed renovations. Barr was also able to help with refinance packaging, human resource management, and creating job descriptions for a new position at the funeral home. After purchasing the business, the Drapers welcomed their first son, Dawson. Dawn is currently staying home with their child, but continues to work with Barr on the day-to-day operations of the funeral home. where they met with Business Advisor, Larry Ellis. Ellis was able to assist the Braders with bank coordination with Kleberg Bank, loan structuring, SBA loan requirements, business valuation, and financial projections. Since purchasing the business, the Braders were able to hire eight more employees, and are looking forward to continuing to grow their business. Seaworthy is now an authorized Garmin installer and repair center, and plans to expanded product selections online and in store from Hobie, Wilderness Systems, Costa Del Mar, and Sea to Summit. Salvador Marquez, a licensed backflow and irrigations specialist, started Marquez Nursery in 2000. The business began by providing basic landscaping needs in Laredo, and has grown to include full-service landscaping, yard maintenance, and sprinkler system repair services. Laredo Veteran’s Hospital, and Union Pacific. The nursery also provides services to state agencies in Carrizo Springs and Del Rio. Marquez Nursery services a large part of South Texas, and looks to eventually expand to North Texas in residential and commercial sectors. Marquez will continue to work with the TAMIU SBDC to open a new machine shop that will specialize in fabricating building materials, such as steel beams and metal pipes for the construction and oil/gas industries. He also has plans to work with his TAMIU SBDC Business Advisor Tina Rodriguez to apply for an 8(a) certification in order to more effectively compete for federal contracts. Soleil Rehabilitation Services is owned and operated by Tomas and Sarah Moncivais. The company offers rehabilitation services to individuals with speech, language, and oral motor disabilities, in addition to the early identification and treatment of children with Autism. Sarah is a trained and educated Speech Language Pathologist, and Tomas graduated from St. Mary’s University School of Business. Moncivaises obtain information on business startups, registration and licensing, and marketing research. 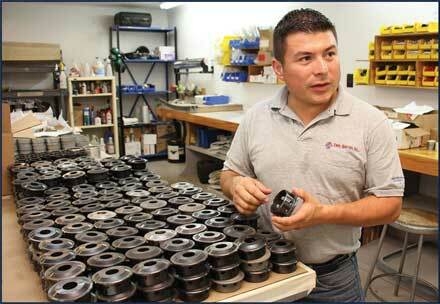 Caballero also helped with a business plan, financial projections, and loan packaging support. Thanks to the guidance of the SBDC, the Moncivaises obtained all licensing and permits required to operate the business and obtained funding to finish out the building and start the business. They were also able to hire nine additional employees. The couple plans on continuing to work with the SBDC on marketing and social media, and looks forward to improving and growing their business to help people in their community.